The Overlord overpants are built from a durable textile chassis and are designed to fit over normal pants. They feature internal D30 impact protectors in the knee along with leg zippers, providing both coverage and the ability for easy on/off. An internal belted waistband provides an adjustable fit. It’s few and far between when you find a good pair of jeans constructed with the sport bike rider in mind. The Timax jeans deliver where others don’t. Its durable denim chassis is integrated with flex zones and stretch knee panels for maximum range of motion. The 3 interior pockets allow for optimal D3O knee impact protectors placement. Reflective black YKK zippers give you that added bit of reflectivity essential for the urban environment. The forecast calls for a 100% chance of nasty. Paired with the jacket, the PDX 2 bibs are a guaranteed rain stopper. Adjustable legs ensure an accurate fit despite varying leg length. Icon used waterproof nylon for the chassis with the addition of a high-backed bib. Seam sealed throughout to ensure waterproofness, the PDX 2 bibs are fit for everything Mother Nature can throw at them. A demanding field-testing process has produced Icon's most adventure-ready pant to date. 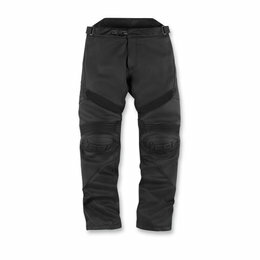 The Raiden DRK waterproof pant is the premier accompaniment to the DKR jacket. Sharing the same Hycor chassis as the jacket, further lengths have been taken with full seam sealing, and full-leg waterproof YKK zippers. Housed within the chassis is a full complement of D30 impact protectors - both hip and knee. Removable boot stirrups and suspenders are also standard. Unmatched capability, leading wearability.